ELOY, Ariz. - An attempt to set a world skydiving record by having more than 220 people free-fall from an airplane in formation turned tragic Thursday when one jumper died during the daring effort at the same Arizona location where two skydivers fell to their deaths last year trying to set a different record. Police identified the victim as Diana Paris, 46, from Berlin, Germany. Her husband told authorities she had completed 1,500 jumps in her skydiving career. Skydive Arizona blamed the accident on a malfunctioning parachute that was released too low to the ground to allow a reserve parachute to fully open. The skydiver was declared dead at the scene. "It had nothing to do with the size of the group or the aircraft," World Team spokeswoman Gulcin Gilbert said. The accident occurred during an attempt to break a world formation record. The group of 222 people from 28 countries was to free-fall from about 18,000 feet then come together in a formation like a snowflake and separate and link in another formation before pulling their parachutes. 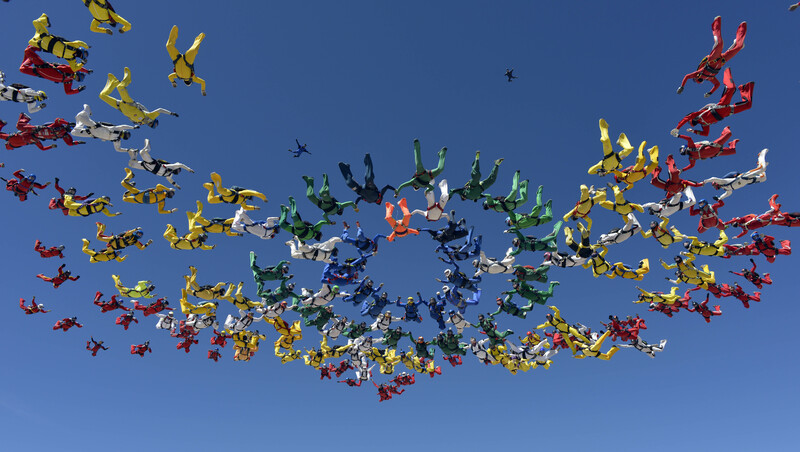 The skydivers hurtle through the air at speeds of more than 100 mph, and they have about 70 seconds to complete the free-fall formations before they must deploy their parachutes. The group did not set the record during the ill-fated jump or during several more after the death. They planned to continue Friday with 221 skydivers. "Our dear friend cannot and will not be replaced," said Gulcin, whose group organized the record attempt. "The group will continue to hold the slot open in the skydiver's honor." Skydivers cried and hugged each other and prayed after they learned of the death. But they also had no interest in quitting because of the tragedy. "You can die crossing the street," said skydiver Debbie Franzese of New York. "It's sad, but also it happens. You know, it just happens." The victim's body was found about a mile from the drop zone. The parachute was collected by law enforcement and will be given to the Federal Aviation Administration for inspection. Skydive Arizona, between Phoenix and Tucson, has become one of the nation's top skydiving spots since it opened in the 1980s. The location is ideal because Arizona's climate and terrain provides clear, sunny skies most days of the year and vast uninhabited stretches of desert that are perfect for jumping opportunities. The site has also had other skydiving deaths in recent months. Two skydivers - from Germany and the United Kingdom - died in November as their parachutes collapsed and they fell to their deaths during an attempt to set a different jump record. Experts say that while skydiving is inherently dangerous, especially with so many people, deaths nationwide are low compared to the number of jumps annually. Last year, for instance, there were 24 deaths in the U.S. out of 3.2 million skydives, said Nancy Koreen of the United States Parachute Association. Koreen described such a group jump as similar to "driving on a super busy highway as opposed to on a straight country road." "There's obviously a higher risk of collisions," she said. However, Koreen added, most deaths do not occur because of equipment malfunction. "Almost all skydiver accidents, whether it's something like this or any kind of accident, almost always it's something because of the jumper," she said. "It's like pilot error." Koreen was unaware of the specific conditions that led to Thursday's death, but she said parachutes are designed with a backup that deploys automatically if it senses the jumper is coming in too fast at too low of an elevation. In this case, she said, the main parachute may have deployed just enough to slow the victim down, tricking the backup chute into not deploying. "If you're under a malfunctioning main parachute," Koreen said, "you may not be descending quickly enough to trigger the device."